Big Dreams Embroidery: Dreidel Banner ITH Project perfect for Hanukkah. 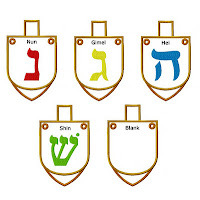 Dreidel Banner ITH Project perfect for Hanukkah. You can make this too! This versatile in-the-hoop project is a fast and elegant way to decorate your home for Hanukkah. After stitching out your banner pieces, simply thread ribbon through the eyelets and either string together as a banner or use them individually as gift tags. You can add letters from your embroidery machine to personalize your banner pieces further if desired! This is a quick and easy two-sided banner all done in the hoop with step-by-step instructions to guide you. You are hooping stabilizer only, appliqueing your fabric and stitching the Hebrew letters over the top, applying backing fabric behind your hoop, finishing the edges and eyelet(s) and trimming away the stabilizer. The banner pieces slide onto ribbon or cord. - and a Blank banner which you can personalize using your own fonts. NB. 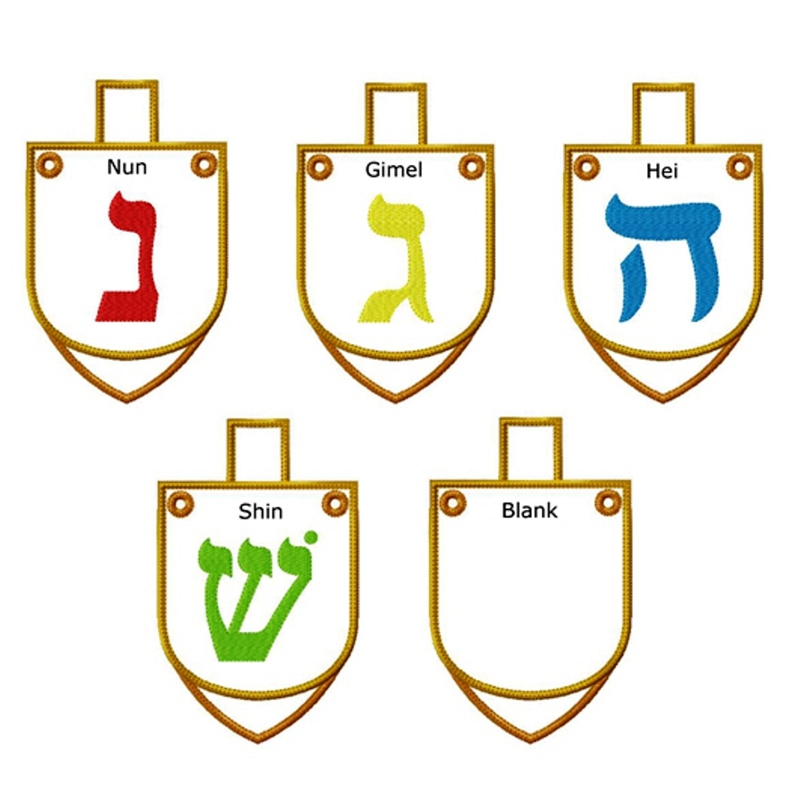 The 4" banner has one eyelet (on the top part of the dreidel) making it also perfect for a gift tag. All other sizes have two eyelets. PICTURED in blue/white are the 6" banner pieces. PICTURED in golds and bright threads are the 4" banner pieces. 4x4 hoop - 3.92" x 2.44"
5x7 hoop - 5" x 3.09", 6" x 3.71" and 7" x 4.31"
6x10 hoop - 8" x 4.93" and 9" x 5.54"
WHAT YOU RECEIVE...- DREIDEL BANNER ITH (5 variations) in the format of your choice.